The art of cooking frugally is only half in the shopping. The other half is in the using--or, in this case, reusing. half a can of mushrooms. Even if a recipe only calls for a portion, you paid for the whole container. It's wise to take stock at the end of the week and see what you can do with what's left. 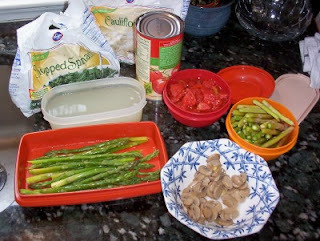 For example, today's asparagus soup will be almost free because those ingredients were counted earlier in the week. Click here to see ALL the posts in the Iron Chef, Aldi vs. Sale Challenge! This is where I fall short sometimes. At the end of the day, I get LAZY and just start chunking half eaten cans, etc. Thanks for the inspiration. I am learning so much from you and Amy. Once we return home with our baby we will be taking a hard look at the budget. Especially the food budget. Thanks for all the inspiration! This is amazing! I thought I was doing well on my personal grocery budget but I'm in awe every time I've popped in here this week. Thanks for the teaching Meredith! CAn you share the recipe you made up for the soup? I was wondering if you could actually use all your leftovers that way? You are a real inspiration. I have guests today, so I'll have to grab some computer time after dinner to make today's post. I'll share how I made the soup and what the entree is, along with the cost breakdown. Looking forward to seeing the recipe!